In any kitchen you have to have a few tricks up your sleeve to make it look seamless. Tiny kitchens are not an exception, but planning may require evaluation of dozens of options for all the appliances and materials. Why? Making it look intentional, and custom will bring more value to you when you sell, and make it much more aesthetically pleasing while you’re there using it. Reason enough! There are few things as disconcerting than seeing a refrigerator float in the middle of a wall or at the end of the kitchen, no companion in site to keep it company, no border to give it a sense of belonging and permanence. The long narrow nature of my kitchen means that you will have to rely on my ability to state and explain the challenge, as this picture will not be worth a thousand words. 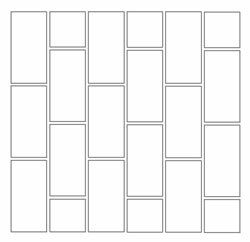 Let’s start with the layout. I employed a basic work triangle even though the kitchen is essentially an L shape. TIP #1: The Butterfly Sink: By installing a butterfly sink at the junction of the L, and placing the stove and the refrigerator at either ends of the L. The petit size of the overall space made moving from one point of the triangle to another relatively efficient. The butterfly sink is particularly nice to have as it allows you to wash dishes on one side, vegetables on another, and it’s more interesting than a traditional sink. TIP #2 Make it Look Custom: Example A. The Kraftmade Cabinets from Home Depot are solid and well constructed with nice features like the whisper close. 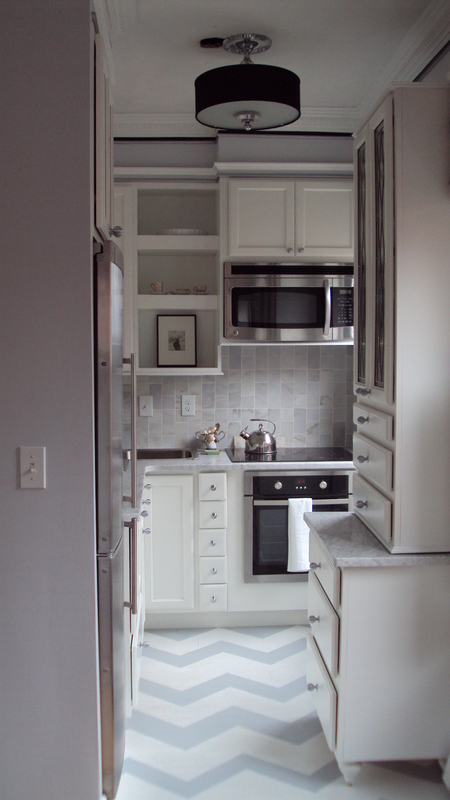 I had enough height to add a series of small 12″ x 12″ above the standard cabinets but the cost was prohibitive. To make it look custom I built a soffit down to the top of the cabinets and added molding to mimic what was in the living room and to provide a finishing strip at the point of connection between drywall and cabinet top. Example B. Remember I wanted the sleek lines and clean design of a European fridge, but didn’t want to pay the price. Size mattered as it needed to be 24″ or less in width and I didn’t want it to be too short. I could have opted for the Liebherr at 6’5″ tall and 24″ wide it fit my specifications but at $3800. not my budget, I could have gone even more uptown with the Marvel – 7′ tall and 23.5″ wide but all that glorious height would have cost me at $4800. I opted for the Canadian Blomberg at 5’8″ tall it wasn’t exactly where I wanted it to be so I gave it a boost. I had my builder craft a step for it to sit on, rabbit it out at the bottom so it would have the proper ventilation, and ta da – it’s just as marvelous as guess know who. Tip #3 Steal Space: After tweaking and trying every imaginable combination layout, I opted to steal 9 inches from my living room to accommodate the already small appliances I selected. Not ideal, but by building a wall on the other side of the fridge inside the living room, one would never have known it wasn’t always there. Tip #4 Multi-purposes Pieces are Brilliant: I created my own high-boy with a tall glass cabinet (wall mounted) and a bathroom vanity (same maker and color) I had a custom piece of marble cut for the top which matched my counter, a had the cabinet fitted with rolling casters. Roll under the glass top for fantastic storage – voila my high-boy, roll out into the middle of the floor, perfect doe rolling station and prep surface. Tip #5: Be a Little Different: While I love the look of a single piece of marble for counter and backsplash, I wanted to add a little texture. Subway tile is timeless and readily available so I opted for a marble subway tile, that I bought on line for peanuts and had installed vertically instead of horizontally. I love the fresh take. Tip #5 Sometimes Wow’s Come from Unanticipated Places: All my hard work, and planning, months of strategizing and inconvenience, dust and sinus infections paid off down to my sweet little honey comb chrome cabinet pulls, but that is not where the “wow” came from. It came in the form of a $300. wood floor, two cans of paint and some frog tape. Gosh darnit. I get more compliments on that floor than the whole rest of the kitchen. Trust me when I tell you, if that kitchen wasn’t flawless the floor wouldn’t matter. I left them with nothing to complain about because in addition to being crafty with the design, I’m a fabulous cook. Wherever is that handsome man waiting to enjoy my culinary delights? Fall food is fantastic.